(International Bicycle and Motorcycle Exhibition in Frankfurt, Germany). One of them was the Mopetta, another was a larger version called the ROLLERA, which had a larger bench seat and a 100cc motor. 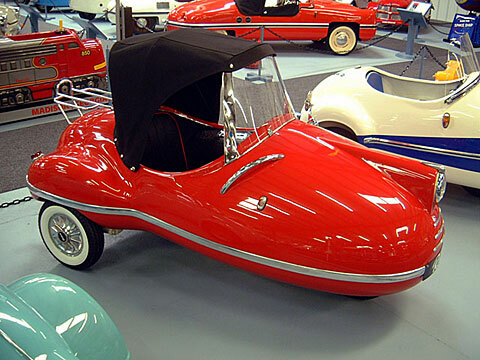 In the summer of 1957, after attempting to generate interest at the IFMA, Brütsch loaded 2 "normal sized cars" with 3 Mopettas and a Rollera on the Roof and in the Trunk and drove around with his Secretary looking for someone who might be interested in producing them. Only 8 units were ever produced (licensed in France) and only Four are known to survive today. Ironically, while Egon Brütsch was one of the most influential and prolific microcar designers, his own marques only sold in very limited numbers. but then sold at Christies in 1997.
and it basically sat in a sandbox and deteriorated. to attain the condition you see it in now. Weight: 85 kg Electrics: 6 v 3 Wheels: 4.40 x 8"